In the century before the Bill of Rights, men and women were sentenced to death on the strength of spectral testimony. Ironically, it was this affront to justice that led the Rev. Increase Mather to sermonize: 'It were better that ten suspected witches should escape, than that one innocent person should be condemned.' Time no longer sanctifies forensic practices, it deconstructs them. Still it is cold comfort for the victims of fictions that have passed for forensic truth. 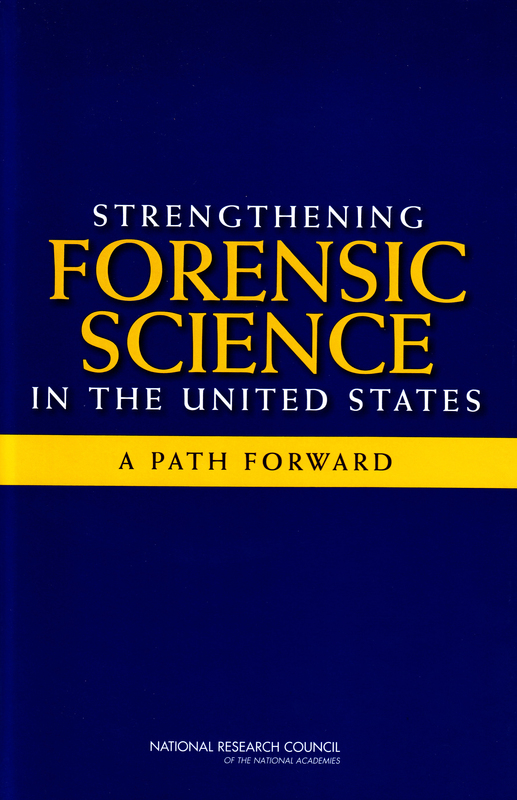 Almost seven years ago, on February 18, 2009, in what was thought to be a watershed development for the use of forensic science in the courtroom, the National Academy of Sciences issued a groundbreaking report called Strengthening Forensic Science in the United States: A Path Forward (2009); the legal community calls it the "NAS report." It questioned whether the underlying research justified the claims forensic scientists were regularly making in courts throughout this country, claims that they had been making for decades. It concluded that for many long-used types of forensic science, including fingerprint identification, firearms identification, handwriting and toolmark identification, experts' conclusions were simply not supported by their methodology or training. There was not an adequate basis for individualization, for linking crime scene evidence to a particular defendant, much less for conclusions that were announced to an exceptional degree of certainty: This bullet matches the gun associated with the defendant 'to the exclusion of anyone else in the world,' as one ballistics expert testified, to my astonishment. Claims that forensic experts can match a bullet or shell casing found at a crime scene to a specific weapon lack a scientific basis and should be barred from criminal trials as misleading, a D.C. Court of Appeals judge wrote this week. The opinion, by Associate Judge Catherine Easterly, is not binding on criminal prosecutions in D.C. Superior Court, where firearms and ballistics evidence have been introduced in scores of violent felony cases in recent years. Easterly's opinion came in response to an appeal brought by Marlon Williams, 36 of Southeast Washington. He argued that his murder conviction in the 2010 fatal shooting of Min Soo Kang, 37, of Fairfax County should be overturned because, among other things, a D.C. police forensics expert improperly declared a "unique" match between bullet slugs recovered from the victim's car and a handgun found in Williams's bedroom. "Those markings are unique to that gun and that gun only," Luciano Morales testified, according to court filings. "Item Number 58 fired these three bullets," he told the jury . . . .
Hsu's article goes on to note that "the U.S. attorney's office for the District called the error 'regrettable,'" agreeing "that forensic practitioners should not state conclusions to an 'absolute' or '100% [degree of] scientific certainty.'" Judge Easterly was having none of it, according to Hsu, telling the government (and all of us) in her opinion that the erroneous expert testimony in Marlon Williams' murder trial was "more than regrettable. It [was] alarming," akin to "the vision of a psychic" with "foundationless faith in what he believes to be true." Despite Judge Easterly's belief that "[t]o uphold the public's trust," errors like those in Williams' case should not be permitted, Williams did not get a new trial, because his lawyer did not object to the faulty expert testimony. More importantly -- the whole reason for this blog -- as Judge Easterly's opinion so effectively points out: Not nearly enough steps have been taken (in the District of Columbia, or I respectfully submit, across the country) to address the reliability problems that continue to plague forensic science in the courtroom -- problems identified way back in 2009 by the highly respected NAS report. It is critical to observe that despite Easterly's strong stand against junk science, it will not only have zero effect on the outcome of Williams' case, but also, since it is only what attorneys call "persuasive authority," it may have little or no effect on D.C. prosecutions going forward. Judge Easterly cannot wage the fight to improve forensic science in our courts by herself. Lawmakers, prosecutors, defense attorneys and forensic scientists, collaboratively working together to implement the reforms the NAS report recommended, have to be the beacon of change. Optimistically, Hsu tells us that Judge Easterly's opinion "continues a nationwide push for heightened scrutiny of forensic techniques and testimony." "But, in fact," as the Honorable Nancy Gertner observed in 2012, "little [had] changed" since the 2009 NAS report's issuance. And now, four years later, despite Judge Easterly's bold stance, it seems the more people talk about improving the use of forensic evidence in the courtroom, the more things stay the same. About the Author: Stephen Cooper is a former federal and D.C. public defender. He writes full-time and lives in Woodland Hills, California. Disclosure: The author collaborated on forensic issues with Judge Easterly when she was an attorney at the D.C. Public Defender Service and served as a character reference for her when she applied to become a judge on the D.C. Court of Appeals.